The Bogmen of Connemara have cut and saved thousands of tons of turf over the years. 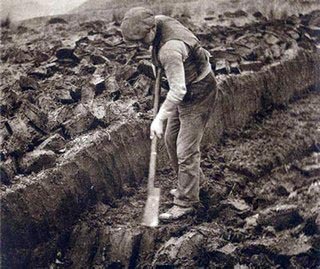 In the past the Bogmen were a vital part of the local economy, providing the fuel for Screebe Power Station and Renmore army barracks in Galway as well as for homes all over the west. Cutting, turning, footing and saving turf is very hard work indeed. When the turf is saved there is every reason to celebrate. In 1959 the Connemara Bogmen did just that! It happened quite by accident. A group of tired but very happy Bogmen tapped a half barrel of stout on the side of the bog road where they shared bog-stories, drank local stout and cooked fine steaks on their shovels which they held over an open fire. In the years that followed, word of the gathering spread and each year more and more Bogmen joined the gathering. In fact, the gathering became so popular that it was moved to a hayloft and attracted singers and dancers from all parts. Since then the Bogman’s Ball has developed into one of the most popular functions in the West of Ireland with three songs recorded about the event and many poems and scéals written. 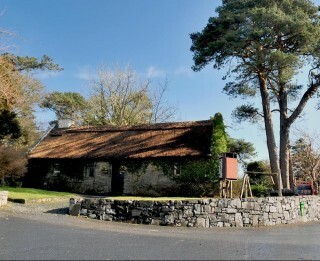 Still organized by the Bogmen to this day, the event has been hosted by the Keogh family at Peacock’s Hotel, Maam Cross since 1980. For the first time since its inception in 1959 the ball did not take place in 1999 in Peacock’s as the hotel was being renovated. The regulars were devastated so for the millennium the Bogmen went to great pains to make sure that the ball would be the best ever. Guests were invited to visit the “Quiet Man” Cottage on arrival where they were saw poteen being made and enjoyed some Bog water Punch!! – not too strong I hope! 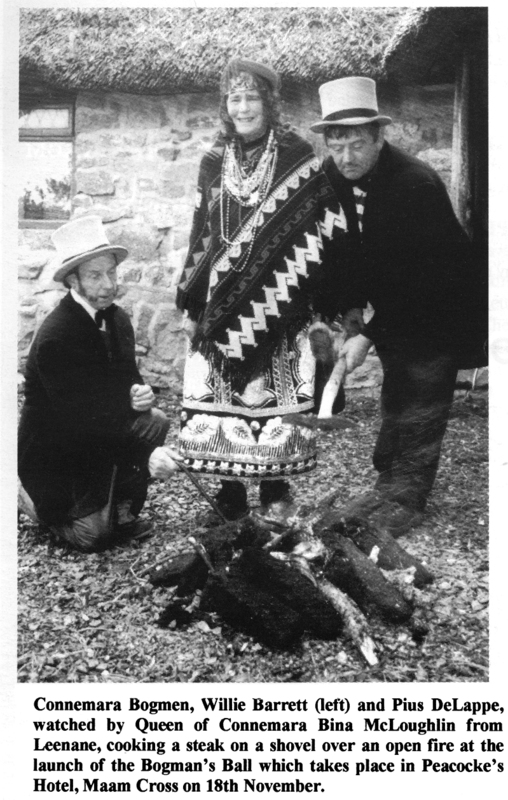 With great ceremony, the Bogmen carried a rack of steaks into the banquet hall. The arrival of the steaks signaled the start of the banquet and the craic synonymous with Irish gatherings. Live entertainment included comedy acts, music from the Conquerors followed by a disco that went on onto the wee hours of the morning.